Ankhesenamun (ˁnḫ-s-n-imn, “Her Life Is of Amun” or “Living through Amun”; c. 1348 – after 1322 BC) was a queen of the Eighteenth Dynasty of Egypt. Born as Ankhesenpaaten, she was the third of six known daughters of the Egyptian Pharaoh Akhenaten and his Great Royal Wife Nefertiti, and became the Great Royal Wife of her half-brother Tutankhamun. The change in her name reflects the changes in Ancient Egyptian religion during her lifetime after her father’s death. Her youth is well documented in the ancient reliefs and paintings of the reign of her parents. Tutankhamun and Ankhesenamun shared the same father but Tutankhamun’s mother has recently been established by genetic evidence as one of Akhenaten’s sisters, a daughter (so far unidentified) of Amenhotep III. She was most likely born in year 4 of Akhenaten’s reign and by year 12 of her father’s reign she was joined by her three younger sisters. He possibly made his wife his co-regent and had his family portrayed in a realistic style in all official artwork. 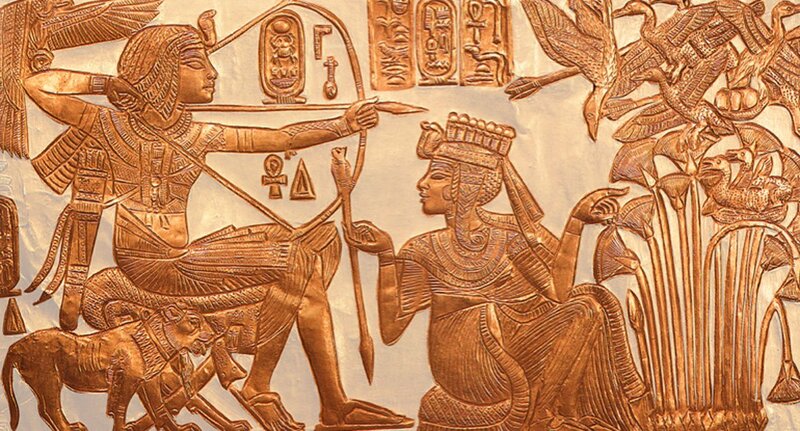 Ankhesenamun was definitely married to one king; she was the Great Royal Wife of Pharaoh Tutankhamun. It is also possible that she was briefly married to Tutankhamun’s successor, Ay, believed by some to be her maternal grandfather. 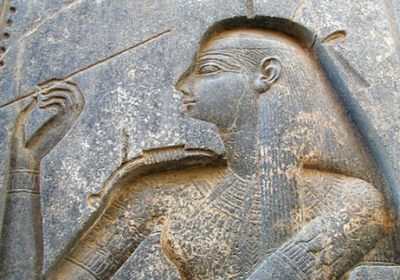 It has also been posited that she may have been the Great Royal Wife of her father, Akhenaten, after the possible death of her mother, and co-regent of Akhenaten’s immediate successor, Smenkhkare. There is little known about Ankhesenamun. She was initially known by her birth name of Ankhesenpaaten (meaning “She lives through the Aten” or “Living through the Aten”) in her earlier years of life. Written, throughout history, are variations of her name as this was altered during her marriage to Tutankhamun. She was approximately thirteen years old when she married Tutankhamun who was most likely her half-brother. Tutankhamun was probably around eight years old at the time that this marriage occurred. This historical timeline is known as the Amarna Period. The alteration of names for both Tutankhamun and Ankhesenamun occurred as they changed their form of worship from one God to another. Their reign initially included the worship of the God Aten (known as “The Sun-Disc) and this eventually changed to the worship of the God Amun (known as the “The Hidden One”). Sometimes Ankhesenamun is written as Ankhesenamon, Ankhesenamum, and other variations on the name. What is known about Ankhesenamun is that she was born the third daughter of Akhenaten and Nefertiti. History tells us that there were at least six known daughters born to this famous couple; Meritaten, Meketaten, Ankhesenpaaten, Nefernefruaten ta-Sherit, Nefernefrure, and Setepenre. The first three daughters appear to have had a more prominent position in the family hierarchy as they are depicted more frequently in pictures than the last three daughters. It appears that Akhenaten, Ankhesenamun’s father, may have attempted to father children with the first three eldest daughters. It is suggested that Ankhesenamun’s second eldest sister may have died giving child birth. This is deducted from a scene found in the royal tomb which portrays a vivid display of this occurrence (a woman dying due to child birth). It is most likely that Akhenaten also fathered children from his other two daughter’s Meritaten and Ankhesenamun. Those children carried the names of their respective mothers with the addition of “ta-sherit” (junior) after their names. Including “ta-sherit” to the name of children who had the same name as their respective mothers, appeared to be the standard practice of that time. As Nefertiti, Akhenaten’s queen disappears from history, Akhenaten marries the eldest daughter Meritaten. She now becomes the Chief Queen after her mother Nefertiti. 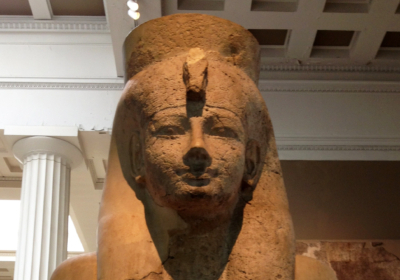 Also during Akhenaten’s reign, he names Smenkhkare as co-regent (a person who would reign in conjunction with him). It was sometimes the practice of Kings or Pharaohs to name co-regents during their reign. Co-regents tended to be son’s or proposed heirs to the throne. During this time, Akhenaten decides to wed Meritaten (his daughter and current wife) to Smenkhkare for his wife. Akhenaten then takes Ankhesenamun, the third daughter, as his next new wife. Ankhesenamun now becomes the Chief wife of Akhenaten for a short period. It appears that shortly after, both Meritaten and Akhenaten die and then Smenkhkare marries Ankhesenamun. History shows that they are married for approximately one to three years and then Smenkhkare also dies. Tutankhamun is named the next pharaoh and Ankhesenamun and Tutankhamun are then married. Although both are still children, Tutankhamun and Ankhesenamun go on to rule Egypt over the next ten years. During the ten years, Ankhesenamun gives birth to two children (both girls). Both girls are born premature and die. One of the children is now known to have had a condition called Spengel’s deformity in conjunction with spina bifida and scoliosis. The two mummy encasements were found during the excavation of Tutankhamun’s tomb. During their reign, history shows that Tutankhamun had an official adviser named Ay who most likely was the grandfather of Ankhesenamun. In addition, it seems that Ay most likely took advantage of the fact that both Tutankhamun and Ankhesenamun were very young and he most probably had a heavy hand in molding and shaping Tutankhamun’s thinking in the early years. This likely occurred as changes and decisions during those early years of Tutankhamun’s rule carried the weight of a more-versed and more-mature ruler and could not have been done by a child of eight years old. As Tutankhamun and Ankhesenamun began to mature, Tutankhamun suddenly died for no apparent reason. Tutankhamun was about 18 years of age when he passed away and once again Ankhesenamun was left without a husband. The standard mourning period was 70 days and it appears that several major things occurred during this timeframe; 1) Tutankhamun’s burial site seems to have been put together in a haphazardly way, 2) Ankhesenamun is not mentioned or depicted at the burial site or are there any personal items of Ankhesenamun buried with Tutankhamun as this was the standard practice of including “wifely items” with the dead pharaohs, and 3) History now shows us that Ankhesenamun may have tried to contact the Hittite King Suppiluliumas for help. King Suppiluliumas was a well-known enemy of Egypt at that time. Upon further review of Tutankhamun’s burial site, it seems that the walls were not fully painted as would have been fitting for a pharaoh of that time. Why? It also appears that many of the items found in the tomb were borrowed and did not belong strictly to Tutankhamun. Again the question is why? Speculation is that Ay, who was most probably in control of the burial procedures, was in a hurry to get everything completed and sealed as he may have been the person responsible for Tutankhamun’s death. Why does speculation lean toward that theory? Most likely because he had much control over the rule of Egypt during Tutankhamun’s rule until the boy king began to mature. He probably wanted him out of the way. In addition, history shows that he married Ankhesenamun shortly after Tutankhamun died and thereby became Egypt’s new pharaoh. Upon review of Tutankhamun’s skull, there is some evidence that Tutankhamun may have died a more brutal death than once thought and Ay is at the top of the list as a possible murderer. In addition, the standard practice of that time would have been to mention and provide many items of the “Chief wife” of a pharaoh in a burial site. 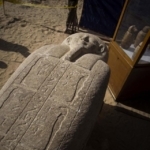 Unfortunately, there is little mention of Ankhesenamun at the burial site. The fact that any personal items belonging to Ankhesenamun at Tutankhamun’s tomb are missing make things even more suspicious. Why would this occur? Could it be that Ay may have been planning to take Ankhesenamun (most probably his granddaughter) as his wife and thereby become the new Pharaoh? It would not have been fitting to have his new wife depicted in Tutankhamun’s tomb. By marrying Ankhesenamun he would then have a direct link to the throne and be more readily accepted as Egypt’s new ruling pharaoh. Amun The third suspicious piece to this puzzle is a letter sent to a Hittite King named Suppiluliumas from an Eqyptian queen. There is speculation that the letter could have been sent from another queen because the names referenced in the letter do not specifically mention Ankhesenamun or Tutankhamun but rather use the names Dahamunzu and her dead husband Niphururiya. However, upon further review of the Hittite phonetic translations of Egyptian language at that time, it would have been translated to point towards Ankhesenamun as the queen asking for help and Tutankhamun as the king having died. The letter states, “My husband has died and I have no son. They say about you that you have many sons. You might give me one of your sons to become my husband. Never shall I pick out a servant of mine and make him my husband!…I am afraid!” Why would Ankhesenamun be afraid? Could it be that she knew that Ay had contributed to her husband’s death? Could it be that she had seen Ay depicted in Tutankhamun’s tomb wearing the royal crown’s of Egypt with his name clearly written in hieroglyphs as the presiding priest over Tutankhamun’s picture? Upon receiving the request for help from the Eqyptian queen, King Suppiluliumas sent Hattusa-zita, a chamberlain, to verify that this was a true request and not a plan of treachery. Hattusa-zita returned verifying that this was not a scheme but rather a true plea for help. 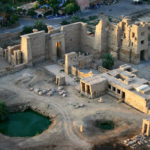 King Suppiluliumas then sent his youngest son Zanannza to marry the Egyptian queen (more than likely Ankhesenamun). Upon entering Egypt the whole group was murdered. Ankhesenamun was left with no other alternative than to marry Ay who was at least 40 years her senior. A blue-glass finger ring has since been found containing both Ankhesenamun and Ay’s engraved names. This is further evidence that this marriage took place after Tutankhamun’s death. Shortly thereafter, Ankhesenamun disappears from history and even in Ay’s tomb there is no evidence that she was the chief wife. Rather, it is Tiy who appears in Ay’s tomb. But as history writes itself, Ankhesenamun had married 4 pharaohs in her short lifetime; Akhenaten (her father), Smenkhkare (more than likely her half-brother), Tutankhamun (more than likely her half brother), and Ay (probably her grandfather). Source: King Tut (kingtutone.com), Wikipedia (en.wikipedia.org).